In a word: Fun and fresh fish. 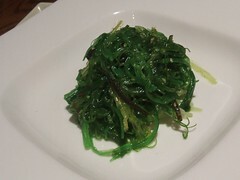 Darby, Dave and Joshua ate the seaweed salad and an assortment of rolls with hot tea. JM ate the tempura shrimp with a lemonade. Nichole ate the omakase with a Singapore Sling. The bill for 2 was $50, or $25/person, plus tip. JM and Nichole gave Takumi an A- (see our grading rubric). Sometimes Madison's small-worldiness can be a really great thing. Thanks to a last-minute change of plans, dear friends Dave, Darby and Joshua ended up at Takumi just after we did and without knowing we would be there, and the server was happy to combine our tables. We sat at a cozy four-top in a nook next to the front door, but Takumi's space provides a variety of seating types in a relatively compact way: there's also a private room, a drinking bar and a sushi bar, and more semi-private hibachi and grill tables in back. Direct but not too bright lighting illuminates the food without blinding the eaters. The server was quick with tea refills, making tea the best beverage choice at our table. The Singapore Sling was sweet and light and the lemonade was from a can. 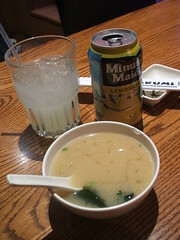 The miso soup that came with JM's hot dinner was thin on flavor, with a quick finish - no lingering umami here. 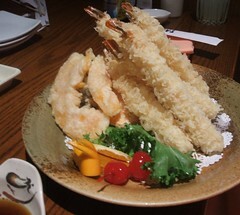 His meal, lightly battered shrimp, were also warm and delicious, though they disappear so fast. 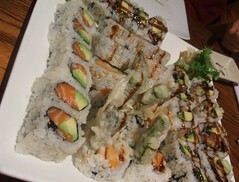 A fresh and pretty seaweed salad complemented the richness of the eel, salmon and avocado in the sushi rolls. The vegetable tempura rolls are a go-to of Darby's, especially in colder months: they're warm, filling, and inexpensive. The fry medium must have been perfect, since the veggie rolls and the shrimp-and-sweet-potato-and-zucchini tempura dinner were both very good. Though we all agreed that Takara's elaborate rolls take top honors, the chef special roll that came with the omakase was no slouch. If anything detracted from it, it was that there was too much spicy mayo that overwhelmed the tempura crab and spicy tuna. Gorgeous, dime-thin slices of avocado fanned over the top made them almost too pretty to eat. The rest of the plate was decent. An oyster dressed in roe and hot sauce was spicy and metallic, while the tuna, salmon, and yellowfin sashimi was good, but the rice fell apart just a bit. Though it was one of the most pricey items on the menu, this plate would stuff a single diner. Some have called Takumi the city's best sushi, and while we aren't ready to pull the trigger yet, it's worth saying that we've been back since our first visit. The second time around, we salvaged a foiled A to Z plan - Trees left - and Takumi saved the day. JM got the chicken tempura, which was also good, and super-filling. Nichole tested the vegetable tempura roll (Darby was right) with a Blue Moon. The beer selection is sushi-bar-appropriately narrow, but our fellow eaters got sake that came in gorgeous faux-cracked flutes. So. 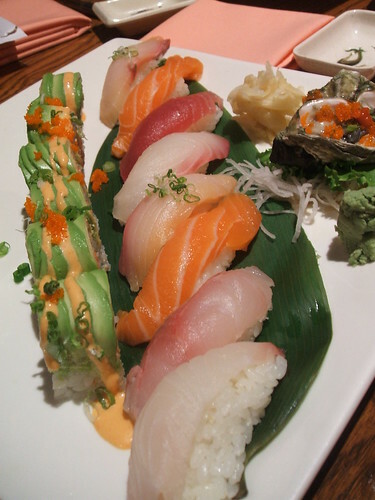 Takumi is a fine choice when eating out near East Towne. God, I'm such an unpolished rube in that TDPF thread. Anyway, the riotous mess that is the candy roll is all kinds of embarrassingly wonderful. In addition, of course, to all the traditional nigiri and rolls.